The sun has crossed the equator and is headed north! We are officially in Spring, but most northern boats are still on the trailer and not in the water. Among us Northerners the lucky hitch up their Whalers and head south for some early season boating. The rest of us stay home and dream... of warm water, sunshine, and classic Whalers! If you're in that group, enjoy this fine southern classic. "I found the boat in a used boat lot in the Keys, bought it, and used it for about 2 years before it went in to storage. 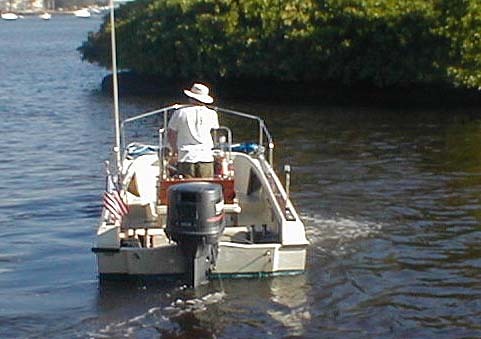 It sat in various boat yards in Florida for 10 years, with its little brother, a 15-foot Whaler with 75-HP Mercury. When the boats were put in storage, nothing was done to "winterize" them, the fuel was not drained from the engines or the tanks. Last year I decided something had to be done about it. I pulled the 15-footer out of storage, cleaned it up, put her up for sale, and sold her within two days for my asking price. "The 19-Outrage was a little more difficult; the trailer had rotted out from under it. I bought a new trailer for it, and found a good Yamaha mechanic to do the engine work for me. That included rebuilt carbs, new fuel lines, oil injection system, and finally a new fuel tank. I guess after 24 years it was time for a new tank. "The boat is perfect for my needs. I try to take the boat out at least twice a week, year round. 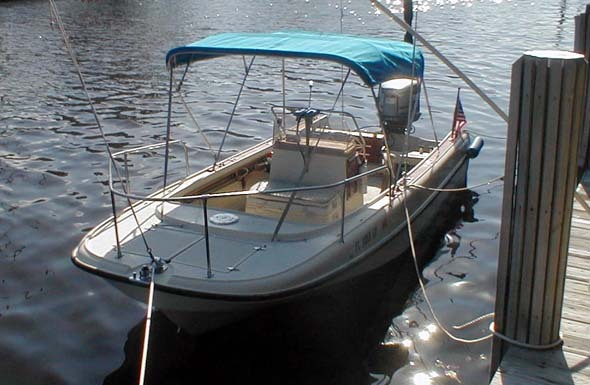 It is large enough for cruising down the intracoastal, and small enough to fit into a crowded dock." 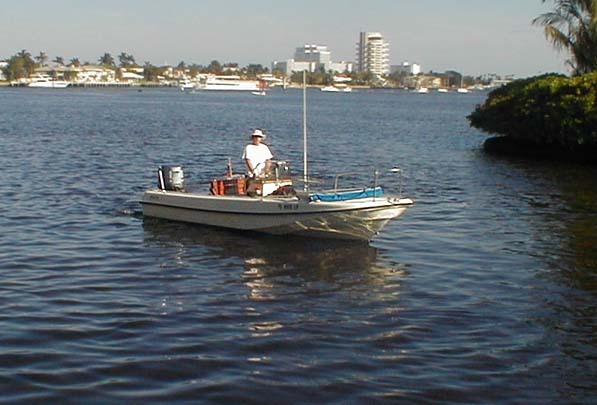 This Classic Whaler from the 1970's continues to thrive in the warm saltwater of southern Florida. A 150-HP 1987 Yamaha engine provides plenty of power. An interesting note, the engine is a Left-Hand or Counter-rotating engine. Propellers are harder to find for these engines, and Ben says he is "very careful" in shoal water with his stainless steel prop. The bow of the 19-Outrage has a small foredeck with an anchor locker comparment covered by a dual opening hatch. Tall bow railing, a classic mooring post, and heavy-duty bi-color navigation light/bow chock fitting complete the deck hardware. This overhead view reveals many of the fine details in this beautiful 19-Outrage cockpit. There is an inside cockpit access hatch to more bow forepeak storage, nicely covered with varnish wood doors. The cockpit is trimmed in wood, a much more traditional/yachty appearance than most modern yuppie/Eurostyle boats can offer. 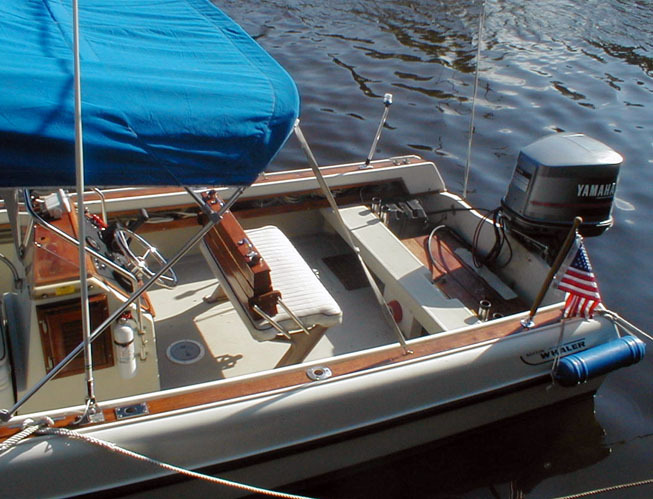 In classic Whaler construction the third molded assembly or top-mold did not entirely cover the hull liner mold, but only added the decking and gunwale tops. The Reversible Pilot Seat glistens with varnish. Woud you really rather have some tufted vinyl on molded polyurethane instead? I also like the location of the battery switch (on the center of the rear motor well dam). The under-gunwale shelves of beautiful wood are another great accent. 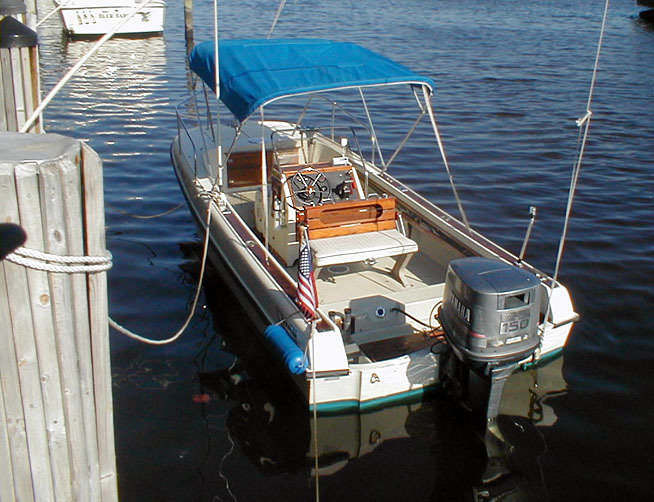 The 40-gallon fuel tank is a very long tank that runs fore and aft under the deck. The filler is in the motor well and the fuel line feed to the engine beside it. 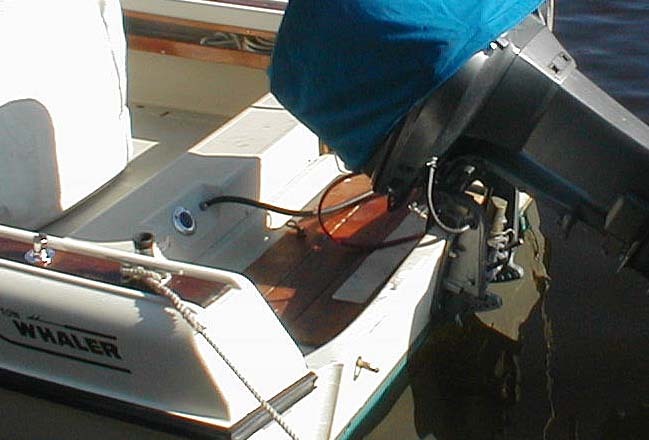 The wooden hatch in the bottom of the motor well covers a live bait well. The motor mounting has been raised above the (already raised) transom at least one bolt hole. Ben is not certain but thinks the engine is a 25-inch shaft model, which would account for the elevated mounting. The raised pivot helps to get the entire lower unit out of the water when the engine is completely tilted up. That is a plus if mooring in salt water. 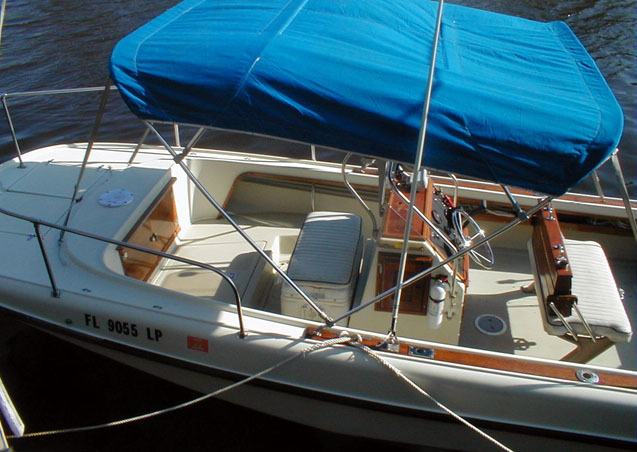 This 25-year old Whaler has turned around for us to better see her classic lines. For the excellent condition you're keeping her in, take a bow, Ben! The page has been accessed 43821 times. This article first appeared April 1, 2002, and it was not an April Fool's joke!